Charles Heaphy was employed by the New Zealand Company as a draughtsman. 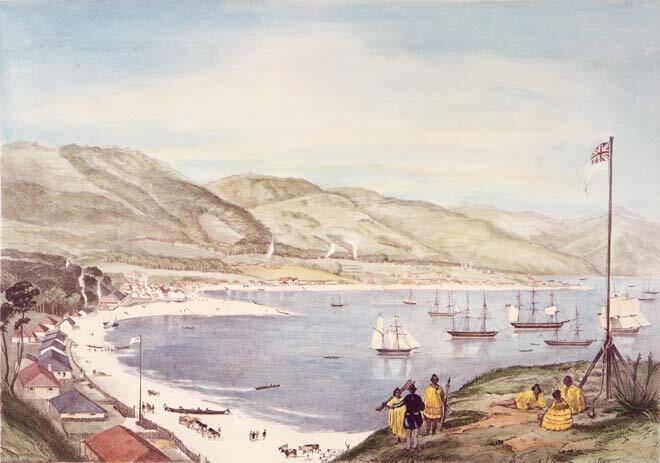 He drew this image of Lambton Quay and Wellington Harbour in April 1841, and it was published by the company the following year. Reflecting his employers' needs, Heaphy presented the new settlement in a positive light in order to attract new immigrants and investors. As a result, cows are wandering along the beach, the Māori in the foreground are welcoming a European, and the hills in the background are gentle and suitable for farming.